New Virtuoso Tourbillon from Bovet.Bovet known company announces a new limited hours Virtuoso Tourbillon. Bovet known company announces a new limited hours Virtuoso Tourbillon. The model is equipped with a round body with a diameter of 45 mm and a thickness of 16.45 mm in 18-carat pink or white gold. Water Resistant – 30 meters. Executed in the form of housing AMADEO ® Convertible, which allows you to transform the model as a wrist watch, and in the desktop or in a pocket watch. Crown set with a blue sapphire cabochon, posted a mark 12. The novelty is no dial, just in the “12 o’clock” is an additional two-way dial. Indication of hours, minutes, carried out by the relevant central arrows on small decentralized dial depicting the Madonna with the child in her arms, as well as through digital clock pointer in the aperture, located at 6 o’clock. On the back of the small dial on the back of a decentralized mechanism side is the minute hand. It has an analog-reserve indicator. 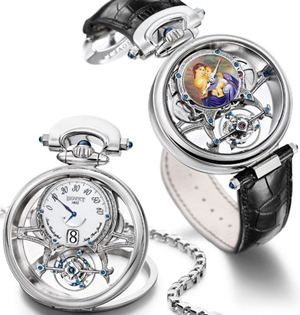 The second hand is placed on a circular minute tourbillon carriage with tags 6. Closes dial sapphire crystal, also installed on the back of the watch. Equipped watch manufactory caliber with manual winding Dimier 16BM02AI-HSMR. Mechanism consists of 439 parts, assembled by 65 stones, has a frequency of 21,600 vibrations per hour, 5-day power reserve, and display functions, hours, minutes. New Virtuoso Tourbillon comes on alligator strap with a buckle in 18-carat rose or white gold, and with an appropriate gold chain. Edition limited to 50 hours of instances in pink and white gold. By the way, the full name of the model – Bovet Amadeo Virtuoso 5-Day Tourbillon Jumping Hours Retrograde Minutes with Reversed Hand-Fitting. It was made at the manufactory Dimier 1738, which is owned Bovet.